According to renowned scholar Brené Brown, empathy “fuels connection.” It’s the ability to understand another perspective so well that you are “feeling with people” rather than simply feeling for them. Feeling what your customers feel and knowing their pain points, thoughts, and needs is the hallmark of a successful business. This type of connection allows for the development of products and campaigns that resonate with users and drive success. Numerous studies have shown the importance of connecting with customers in this way. For example, Pragmatic Marketing found that companies focused on user needs were twice as fast at getting new products to market and 31% more profitable. They also boasted 10-20% higher customer satisfaction levels. Increased profitability may be connected to findings published by ITSMA. The study said that 81% of buyers will pay more for solutions specific to their industry. How can developers, designers, marketers, and business leaders tap into the thoughts and feelings of their users to drive success at their company? One solution is empathy mapping. Just looking for an empathy map template? Skip the text and jump right into Lucidchart. 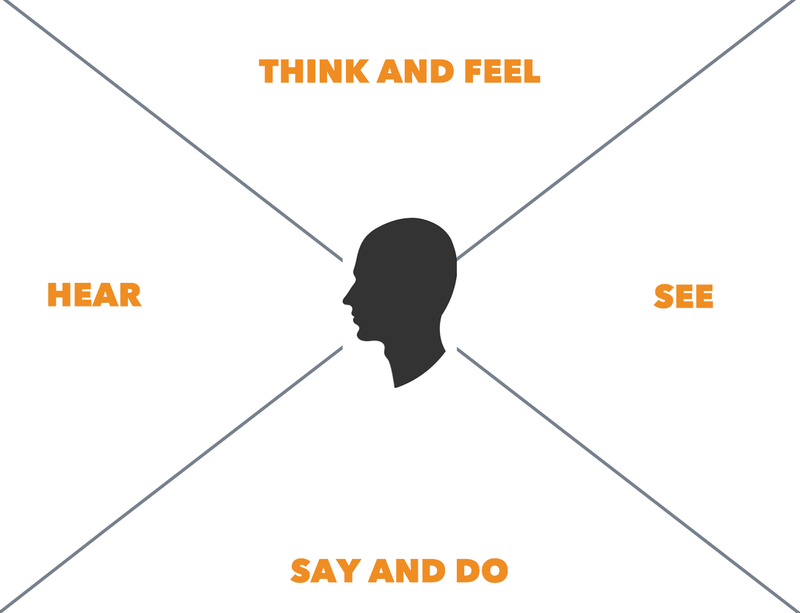 Empathy mapping helps UX designers, marketers, salespeople, and product developers quickly get inside the heads of their customers. After taking some time to think the way their users think, these professionals are empowered to make customer-oriented decisions during every step of product development, testing, and release. How does empathy mapping work? Typically, empathy mapping occurs as a team activity. Everyone gathers in a room, bringing with them any data, insights, customer feedback, or experiences related to the persona in question. The team lead draws a large X on a whiteboard or poster pad and gives labels to the four spaces the X creates: think and feel, see, say and do, hear. At the center of the X, the leader draws a face to remind the team that they are talking about real people during the exercise. If artistic, they may choose to add details to the face that represent the persona in question. Note that empathy mapping may be done for a group of people or for a specific individual. Next, team members are given a stack of sticky notes and a pen or sharpie. Participants write their thoughts, quotes, and data about the persona on sticky notes and then place the notes on the empathy map in one of the four labeled categories. What does a typical day look like for this person? When using our product, where will this person be? What are they seeing and hearing around them? What will friends, colleagues, and other influencers say about this person when they use our product? How does this person feel when they use our product? What does this person say and do when they use our product? How would that change in a public or private setting? How might this person benefit from using our product? If your team struggles to produce thoughts, try role playing. You’ll probably feel a little embarrassed at first, but with a positive attitude, role playing can also be fun and extremely beneficial. Pain and gain are the most important sections of your empathy map. They serve as a sort of hypothesis that you can use to make decisions during development and further test with thorough persona research. 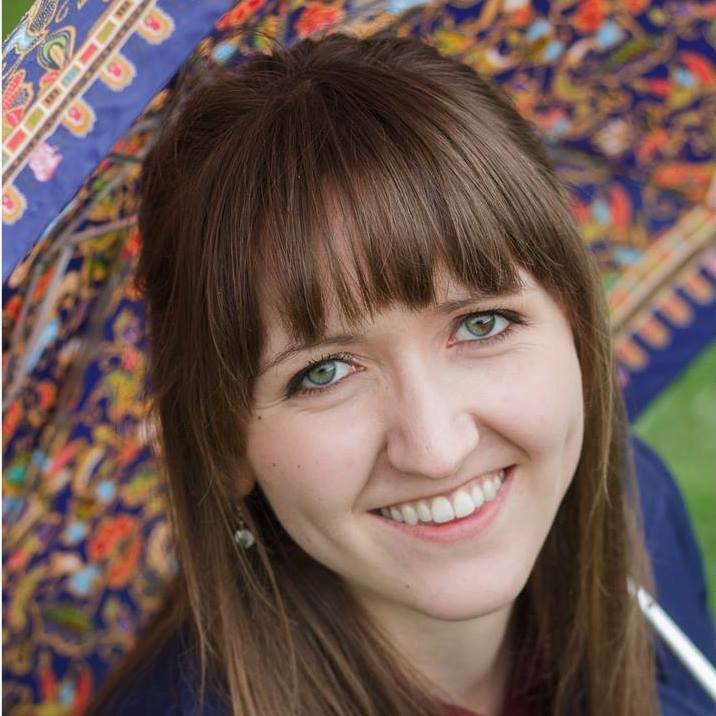 When should I use empathy mapping? 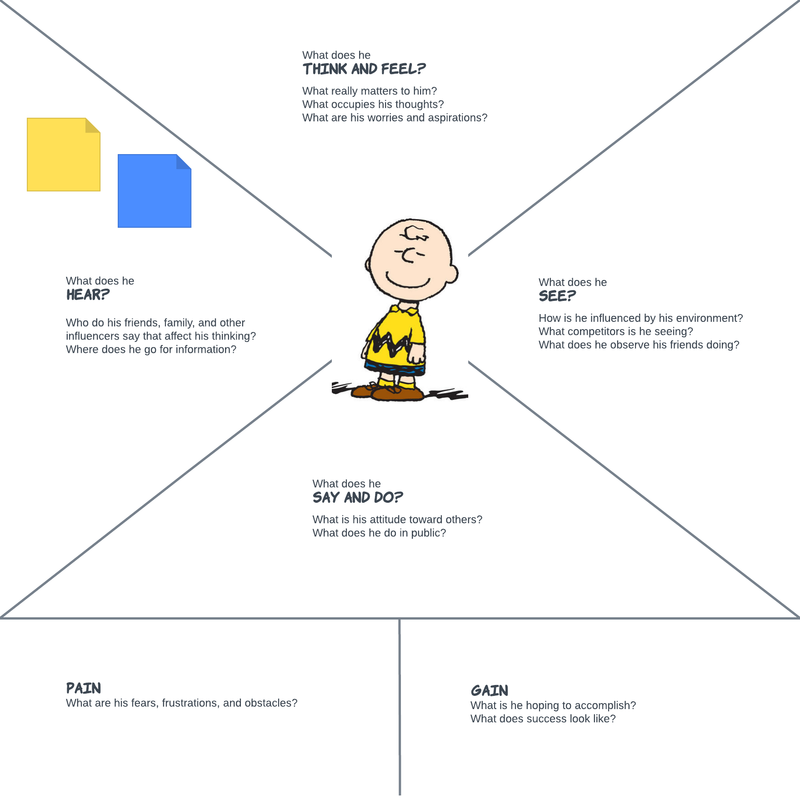 Empathy maps are helpful whenever you need to get into a customer’s head. For example, you can use them to clarify market segments or flesh out users in a user story. However, empathy mapping is often most helpful at the beginning of a new project and is routinely done between initial user research and drafting project requirements. How do I make empathy maps with a dispersed team? That question is easy. Use Lucidchart. It’s online, collaborative diagramming software that your entire team can edit in real time and use for months to come. Customize your empathy map by importing a picture of the persona you are discussing. Record your thoughts on virtual sticky notes that will never lose their stick and get lost. 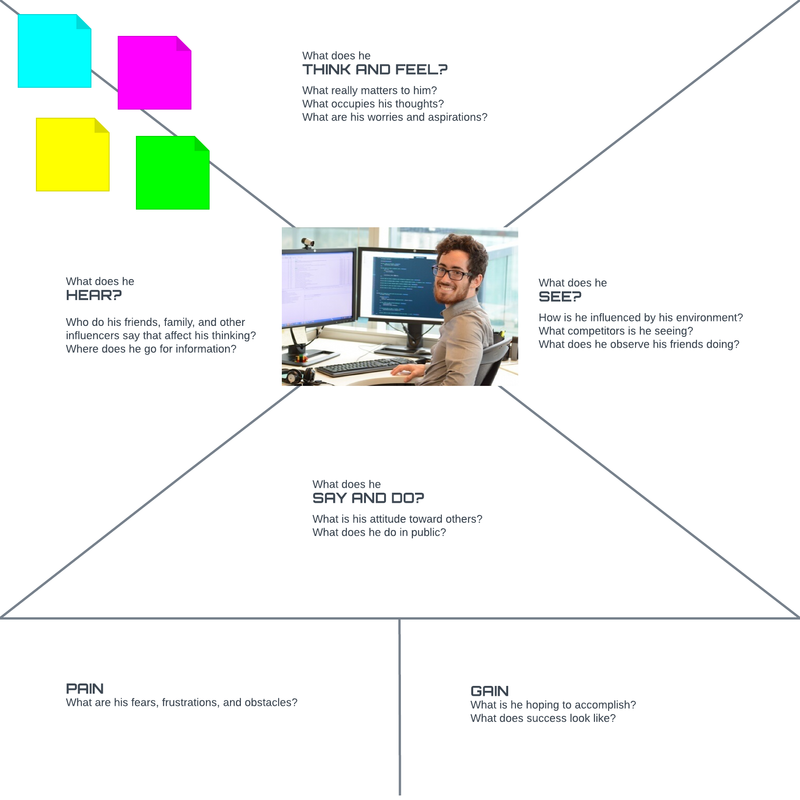 Save your customer empathy map as documentation and reference it the next time you start a project. Share it with the entire team in an editable format for ongoing ideation.